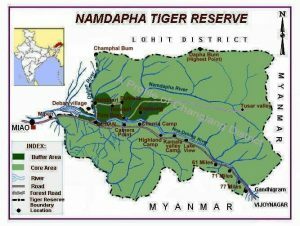 Namdapha, a National Park and Tiger Reserve, a true wilderness and enchanting beauty of lush green vegetation, impenetrable pristine and virgin forests covered an area of 1985.23 square kilometres having diverse flora and fauna lies in the international border between India and Myanmar (Burma) within Changlang District in the state of Arunachal Pradesh in the northeast India. Namdapha National Park is located at a few kilometre away from Miao amidst misty blue hills along the turbulent Noa-Dihing river lies in the sprawling tropical rain forest. It was declared as Tiger Reserve by the Government in 1983. The beautiful forests possess great biodiversity of Flora and Fauna. A details study of its species and genetic variation has not yet been thoroughly done. Namdapha is Botanist’s dream and it may take as long as 50 years to complete a comprehensive survey of its botanical resources. There are more than 150 timber species. The Pinus merkusi and Abies delavavi are not found elsewhere in India. One of the rarest and endangered orchids, the Blue Vanda found here. The most famous local medicinal plant Mishimi Teeta (Copti teeta), which is used by the local tribal for all kinds of diseases is available here but its export has been banned. The diverse vegetation and habitats of Namdapha grooms diverse species of animals and birds. It is only park in the World to have the four Feline species of big cat namely the Tiger (Panthera Tigris), Leopard (Panthera Pardus), Snow Leopard (Panthera Uncia) and Clouded Leopard (Neofelis Nebulosa) and numbers of Lesser cats. A number of primate species are seen in the park, such as Assamese macaque, pig-tailed macaque, stump-tailed macaque and number of the distinctive Hoolock Gibbons (Hylobates Hoolock), highly endangered and only ‘ape’ species found in India dwells in this impenetrable virgin forest. Of the many other important animals are the elephants, black bear, Indian Bison, several species of deers, reptiles and a variety of arboreal animals. Among the bird species, most notable are the White winged Wood Ducks, a rare and endangered species, the great Indian hornbills, jungle fowls and pheasants flop their noisy way through the jungle, and which harbours other colourful bird and animal species. The inaccessibility of greater part of the park has helped to keep the forests in their pristine and virgin state in its natural form. Moreover, the park possesses great bio diversity of flora and fauna. The lush green under growths are thick and intertwined like cobwebs of canes, bamboos, wild bananas and variety of vegetation The grandeur of the wet tropical rain forest is breeding ground for varieties of animals and birds which is remarkable and worth seeing. A beautiful forest camp on the bank of the river Noa-Dihing. It is located within the boundary of Namdapha National Park. One can enjoy the scenic beauty of overlooking Noa-Dihing river. The Forest Inspection Bungalow located at Deban itself surrounded by evergreen forest over looking the river Noa-Dihing is worth-staying. It is also ideal for trekking, hiking and angling on the river Noa-Dihing. Located on the Noa-Dehing River bank 25 Km from the Deban Forest lodge. This is a popular camping site full of nature’s splendours. The track leading to the idyllic spot is enveloped by luxuriant forest and it is not un common to come across birds and wild animals on the way. For camping at Firm base, equipment and guide provided by the forest department is an unique experience. Just 9 Km from Deban, this is as the name suggests is a homing ground for hornbills. Here flocks of these birds can be frequently spotted flying from one grove to another. This pictureque camping spot, just 5 Km away from Deban, lies across the Noa-Dehing river can be reached by boat. An overnight stay here is enjoyable experience in jungle camping. This is an enchanting camping site overlooking a large aquifer and derives its name from its several natural springs. You need to be extremely lucky for an opportunity to stay here overnight and exprience close encounters with wild animals frequenting the water holes in the dark. This camping site, as the name suggests offers a vantage point for a breath-taking view of Namdapha and its lush green landscape. There are a pair of large forest-encased aquifers in this spot providing grazing pasture for a number of herbivorous. The 5 Km track from Gibbons land to this enchanting site is a veritable feast for bird watchers. It is situated in the southeast periphery of Namdapha. This is the remotest and the last village in India wedged China and Myanmar and is the home land of Lisu (Yobin) tribe. The village is at a distance of about 120 Km from Deban. A weeklong trek through lush jungles is more enjoyable for those having a craving for adventure.